Runners tend to obsess about running shoes and clothing. Are the shoes comfortable? Do they fit my style of running? Will my clothing wick sweat effectively? Does this outfit make me look good? Don’t overlook running headgear! Putting a lid on your top for your next run will have benefits that are similar to your running shoes and clothing. Check out this list of running headgear benefits and see our recommendations. Get the one that best fits your needs and take off! We recommend the UA Launch ArmourVent Cap to wick sweat and keep you cool. Depending on your location and environment, you’ll want to keep your head cool if it’s hot and warm if it’s cold. Wearing a running hat in warmer temperatures wicks sweat from your head keeping you cool through evaporating sweat. It also helps keep sweat out of your eyes. 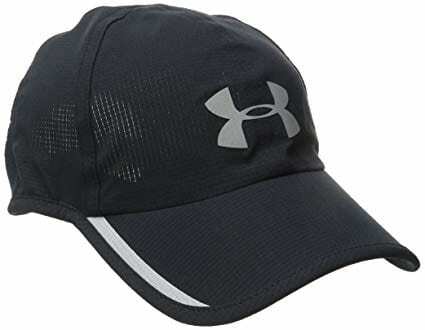 A hat like Under Armour’s Launch ArmourVent Cap keeps your head cooler with its breathability. In cooler temps, you’ll want to maintain breathability while not allowing all of the heat from your head to escape. The ability to wick sweat away from your head and dry quickly is important, especially if you’re running in much colder temperatures for longer distances. The UA Vented Run Beanie provides exactly what you need. The material is light and keeps your head warm, it wicks sweat and dries quickly, and the mesh insets allow for ventilation. If you run with long hair you know the importance of taming your lovely locks. You want the same benefits listed in Reason #1, but you want to keep your hair from flying everywhere and sticking to your neck and/or back. Men’s and women’s running headgear can get the job done. We recommend the UA Fly-By Cap . It’ll keep you cool while extending your ponytail further from your neck and/or back. This allows those areas to ventilate better and allow your hair to dry quicker. Running headgear will protect your face from the elements, just like sunglasses. A low profile cap like the UA Microthread Run Crew Cap will help keep debris out of your eyes, especially rain. It will also keep the sun off your head and your face. Running headgear can also protect from wind and dust, especially on those early morning long runs when everyone is out mowing their lawn. Protection from the elements includes people! If you don’t want to be bothered on a run, wearing a hat can help conceal your identity. This allows you to focus more in your stride, breathing, and rhythm. Who doesn’t want to look good when running?! Some say looking good it half the battle. It’s an accessory, so have fun with it! Get bright colors or radical designs. You’ll feel more confident during your workout. You’ll worry less about your external conditions because you have protection, allowing you to focus on the task at hand. Add in the fact that most running headgear has reflective properties. This is one more layer of visibility to keep you safe on those early morning or late evening runs.